Q. What is the euro? It's a common currency that has replaced 16 national currencies in Western Europe--among them, the French franc, the German Mark, the Dutch guilder, and the Italian lira. The euro is divided into 100 cents. 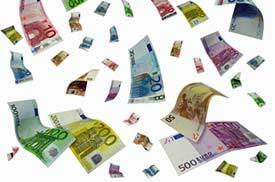 Prices and other amounts are typically quoted with the symbol € or the abbreviation EUR. Q. Which countries are participating? Other countries that use the euro as currency (but aren't members of the euro zone) include Andorra, Monaco, San Marino, Vatican City, Kosovo, and Montenegro. As you can see from the lists, many European nations have chosen not to support the euro: among them, Britain, Switzerland, and all but one of the Scandinavian countries. Others haven't met the economic requirements for participation in the common currency. Photo copyright © Slavoljub Pantelic.